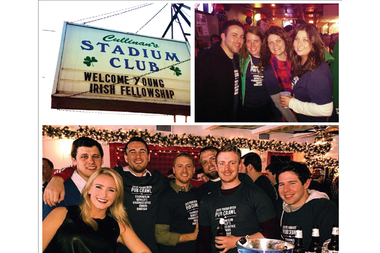 The Young Irish Fellowship Club of Chicago will have its South Side Pub Crawl on Saturday. The North Side group will visit five bars along Western Avenue in Beverly and Morgan Park. BEVERLY — The Young Irish Fellowship Club of Chicago will visit bars along Western Avenue in Beverly and Morgan Park Saturday for its annual South Side Pub Crawl. Tickets to the event cost $20 and include a T-shirt, transportation between bars and a donation to the Danny Did Foundation and Weish4Ever, a cancer charity named for former Brother Rice High School football star Andrew Weishar. Meanwhile, the Edgebrook-based Danny Did Foundation raises money for families with children suffering from epilepsy. Mike and Mariann Stanton started the charity in January 2010 after the unexpected death of their 4-year-old son Danny in December 2009. "Having the pub crawl back on Western Avenue is great for South Siders, like myself, who grew up in the neighborhood but now live in different parts of the city. It's also great for our North Side friends to come experience the hospitality of the South Side Irish on Western," said Connor Kelly, president of the social club. Kelly expects about 200 people to attend the event which begins at 11:30 a.m. at Galway Arms at 2442 N. Clark St. in Lincoln Park. The bus departs for the South Side at 12:15 p.m.
"We hold most of our events on the North Side or closer to to the Loop. But we have a growing number of members joining with 60643 and 60655 zip codes, so its great to come back to Western and get more people involved in the club," Kelly said. • 1:30 p.m. the South Side check-in begins at Cullinan's Stadium Club, 11610 S. Western Ave.
• 3 p.m. at McNally's, 11136 S. Western Ave.
• 4:30 p.m. at O'Rourke's Office, 11064 S. Western Ave.
• 6 p.m. at Barney Callaghan's, 10618 S. Western Ave.
• 7:30 p.m. at Sean's Rhino Bar, 10330 S. Western Ave.
• 9 p.m. the bus leaves to return to Galway Arms.